Portofino is a chic and charming resort for chic and charming people. The yachting crowds adore it, it's spectacularly located: beautiful to look at from the water, and it's beautiful to gaze out over the Mediterranean from Portofino. The atmosphere is golden with sunshine, and the kind of happy wellbeing one must get from owning a beautiful yacht. While the town has some incredibly luxurious hotels, your wallet doesn't have to stretch too far to holiday in one of the best places to stay in Portofino. Portofino's beauty means this little fishing village couldn't stay undeveloped for long, but it still has plenty of character. The waterfront is the place to be, with old customs and new faces (American bars, for example) creating a friendly, vibrant atmosphere. Most of Portofino's pleasure can be found from simply strolling around, relaxing on the beach and enjoying the feeling of contentment Portofino permeates. For those looking for a break from Italian Rivera perfection, the Castello Brown, a 16th century castle, and Divo Martino, and 11th century church, are two of the highlights in the area. It's also worth doing a spot of cruising, on one of the public boats, if you didn't bring your own yacht this time. Don't forget that this village is a hugely popular holiday destination so if you want to guarantee a room in one of the best places to stay in Portofino during the peak summer months, don't leave it till the last minute! Romantic, meticulous and private, the Hotel Eight Paraggi nestles into a beautiful private bay just around the point from Portofino. The 13 rooms are stunning and modern with balconies and hot tubs. And there's a great restaurant, though they also offer private, candlelit suppers on the beach. Domina Home Piccolo is a refined period villa immersed in lush vegetation, typical of the Ligurian Riviera. In contrast, rooms are modern with minimalist furnishings. An ideal couples escape. 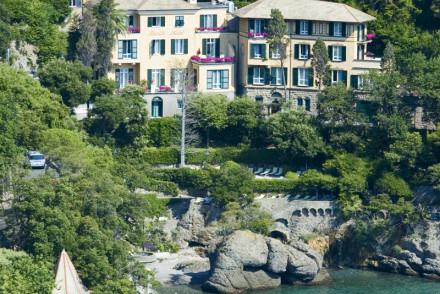 This luxurious Italian hotel is set on a stunning hillside, overlooking Portofino harbour. 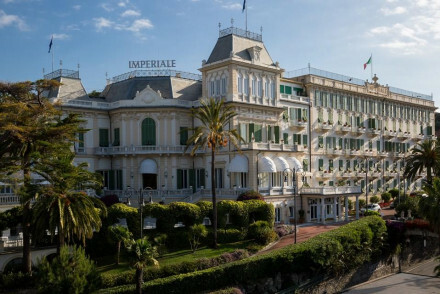 Hotel Splendido boasts timelessly elegant rooms and impressive sea views. 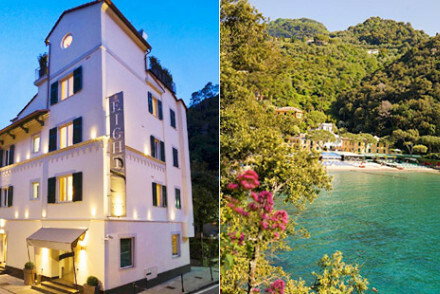 Hotel Eight sits on the hill just above Portofino, occupying a beautifully converted Ligurian farmhouse. As well as chic, contemporary rooms with balconies and all the mod. cons, there's a charming garden with outdoor jacuzzi and you're within a short walk of Portofino's excellent selection of restaurants. If you think that you'd rather have your own space, then visit our online partner, booking.com, for a wide range of apartments and villas. The closest major airport to Portofino is the Christopher Columbus airport in Genoa located 35.8km from the village. Other accessible airports are Nice, France (Aeroport Nice Cote D'Azur ) or Milan, Italy (Milan Malpensa), the drives are longer but very beautiful. Best time to visit - Portofino is a year round destination with its moderate climate, but for long days and warm weather June to August are the most pleasant with temperatures averaging around 29°C. A refined period villa immersed in lush vegetation, typical of the Ligurian Riviera. In contrast, rooms are modern with minimalist furnishings and stunning views. Enjoy breakfasts on the terrace, fresh fish and traditional Ligurian cuisine in the hotel restaurant. Truly romantic. 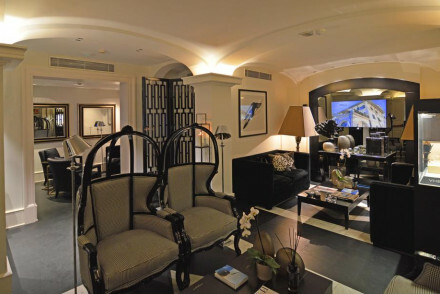 A luxurious 5 star property overlooking the scenic Italian Riviera. Elegantly dressed throughout, the rooms are no exception. High ceilings, floor to ceiling windows, wooden floors and antique furniture abound. Some of the best also have frescoes and chandeliers. Italian indulgence at its very best. Total relaxation - A luxury property on the tranquil Italian Riviera complete with indulgent spa. Sights nearby - Visit the Palazzi dei Rolli declared a UNESCO World Heritage Site. Great walks - Take long walks through the scenic Portofino Park. A Ligurian villa nestled in a private bay on the Italian Riviera. Stunning modern rooms and suites with balconies and hot tubs, fabulous Italian cuisine, private candle lit dinners on the beach, and plenty of sun traps to bathe in. An ideal choice for a romantic beach holiday. Foodies - Meticulous Italian cuisine. Outstanding location - Set in a private bay on the Italian Riviera. A Ligurian farmhouse perched on a hill just above Portofino village with a charming private garden with jacuzzi. Contemporary chic rooms and suites have all the mod cons, balconies, and attractive furnishings. Charming breakfast verandah and walking distance to restaurants. Romantic, picturesque. Traditional - A traditional Ligurian house. 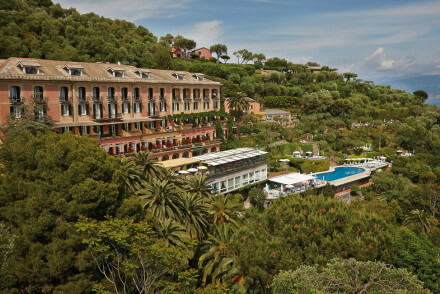 A luxurious Italian hotel set on a stunning hillside, overlooking Portofino harbour. Rooms are timelessly elegant and boast impressive sea views. A choice of three sophisticated restaurants, serving traditional Italian cuisine. Swimming pool, spa and health centre. Quintessential Italian splendour. Kayaking - Explore the wonders of the Italian Riviera aboard a kayak. Diving - Hotel's own Scuba Diving programme.